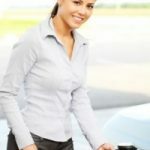 With all the recent talk about high gas prices and strategies for improving your mileage, I thought I’d highlight a recent article from Consumer Reports on getting the best fuel economy for your buck. CR dug through their recent ratings and compiled a list of the most reliable cars ranked by their cost per mpg. Despite their high overall mileage, it’s interesting to note that hybrids stumbled a bit on this list to their higher price. Nonetheless, the Prius did quite well, especially considering that it’s a good bit larger than the Fit. It’s also worth noting that the Toyota Yaris ($370/mpg) and the Hyundai Accent ($425/mpg) beat out the Honda Fit, but they scored too low in other tests to be included. This post has been included in the 141st Festival of Frugality at Almost Frugal, going live September 2, 2008. Please link back to the festival when you get a chance! Needless to say, if you buy used the figures will be even lower (like $200/mpg for a used Taurus). Though as Mary said, it won’t take into account the total cost of ownership. Hey, my cadillac de’ville isn’t on there! haha…. guess they don’t like my 14 mpgs. SomeGuy: It’s based on the price for the base model, which is what they used for getting their mileage estimates, too. The price of the Prius can vary quite a lot depending on what option group one gets. What price did you use when doing your calculations? Also, a lot of folks who bought hybrids got a tax refund (up to $3,600 for the Prius). Yes, Mary. It’s cost of car divided by mpg. And yes, the line up a bit differently than based on cost alone. For example, the Prius costs a bit more than some of the others, but it gets such good mileage that it rises pretty high on the list. On the other hand, there are some hybrids for which the premium is so large that, even with higher mileage, they don’t make the list. I’m sure I’m being obtuse but I don’t understand the price/mpg figure. Are they saying, for example, that the Honda Fit Sport costs $464 for every mpg it gets? Or $464 for every mile it drives? Sorry, I can’t make that formula click. I don’t get Consumer Reports so I can’t read their explanation. Oh wait, is it the cost of the car/mpg they claim? What is the purpose of that figure? To show some of these high mpg cars are more expensive than others? Do they line up differently than if you just look at the purchase price of the car? If they leave out the ownership costs I don’t understand why this figure is useful. Sorry, I know I’m missing something obvious but I sure don’t see it! I gotta agree with Blaine. The Fit may seem small but really it is not that small. There is a new design for the 2009 model year and the Fit will be a tad larger, but still achieves great gas mileage. Ever since the Fit was released in America they have been selling so fast that it is hard to find one at a dealer. The car is very versatile, especially with the way the interior was designed, specifically with the so called “Magic Seats”. Two of my friends both bought Yarises a couple years back, and I just bought a Honda Fit Sport a few months ago. I’m loving it; I get 42-46 miles per gallon commuting to work, and about 38 mpg if I have to go on the highway. It’s smaller than anything else I’ve owned, but there is a lot of interior room for such a small car. I have yet to run into any problems w/being able to move whatever I needed (and I’m used to having had a pickup truck) and it’s a helluvalot easier to park than any of my previous vehicles.